So… Anakin, Ahsoka, Luke, and sometimes Obi-Wan and Mace? Sounds about right. There are three themes in this two-part arc, all of which recur throughout the Star Wars annals. Don’t let your feelings get in the way of your duty. The natural world is pure and good. Let’s begin with number three. The story starts with a space battle because — the galaxy is at war! I guess that’s another recurring theme? There is always a war going on in Star Wars. Weird, I know. Anyway, the battle is raging and in order for our heroes to escape, Anakin Force-pushes them all through the blast doors, sealing himself in with a giant explosion. He Force-shields, but is severely wounded. Because of this, Anakin spends about a third of these episodes injured and semi-conscious. This does not stop him from single handedly stopping a super weapon in the climax. He’s just that good. The Republic ship crash lands on a planet populated by pacifist lemurs (the Lurmen) who want nothing to do with the war raging in the stars. They represent theme number two. The Lurmen live in mud huts that resemble beehives and practice nonviolent resistance which includes fighting off indigenous predators with ropes and standing by while Separatist Droids ransack their village. The leader of the Lurmen, Tee Watt Kaa, sends his son, Wag Too, with Ahsoka to heal Anakin. Wag Too is a really good herbalist because Anakin gets back into fighting form overnight. Of course before the Lurma doctor arrived he also successfully held off one of those wild beasts while injured and semi-conscious because, again, he’s Anakin Skywalker. Voiced by George Takei which is cool because George Takei but also not cool because leftover racism from The Phantom Menace. Lok has a new weapon and he’s decided the pacifist Lurmen are the perfect people to test it on, just like Tarkin tested the Death Star on the peaceful and weaponless citizens of Alderaan. But Alderaan was at least allied with the Rebellion, the Lurmen told both the Separatists and the Jedi who represent the Republic to Get Out. Lok’s weapon is actually more useful than the Death Star in that it is able to destroy all natural matter but doesn’t touch technology, like battledroids. That’s impossible, and thematically transparent, but sure. Before the super weapon is revealed, the Jedi agree to let the Lurmen (not) fight their own battle against Lok and his droids. It doesn’t sit well with Ahsoka, but she’s still learning. Which brings us to theme number one. Aayla: The needs of the many outweigh the needs of the few, or the one. That’s right, I wouldn’t be a very good Vulcan either. To be fair, Aaayla handles this conversation better than any of the other Masters have thus far – she admits to going through this with her own Master and tells Ahsoka not to feel ashamed. But I remain fundamentally opposed to the idea. There is also a generation split within the Lurmen: Tee Wat Kaa says the Lurma philosophy of non-violence is worth dying for. Wag Too says the Lurmen people are worth fighting for. This discussion is the kind of thing I point to when people say Star Wars is just space battles. The series makes it clear Lok is definitively wrong but no one is portrayed as definitively right, and that’s powerful. 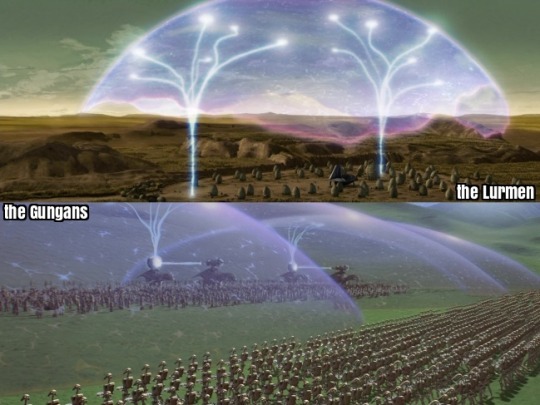 Back to Amazing Anakin, Team Jedi steal a shield from the Separatists and put it up around the Lurmen village, then set up to fight off the droids. This protects them from the first volley but Anakin knows it’s a stop-gap measure and runs off to take care of the weapon. Anakin, alone, cuts though the battle droids and their tanks, disables the super weapon, and captures Lok Durd. Throughout all this he’s still bandaged and yesterday he was dying. Star Wars loves to pit nature against technology, and nature is always on the side of good. In Return of the Jedi, the Ewoks defeat the stormtroopers. In The Phantom Menace, the Gungans rise up against the battle droids. The Republic falls because it creates a clone army. Obi-Wan and Yoda retreat to nature in their exile. Our heroes Anakin, Luke, and Rey grew up surrounded by empty sand. Vader is literally made of technology. Kylo covers himself with technology to appear more evil. “This is the weapon of a Jedi Knight. Not as clumsy or random as a blaster. An elegant weapon for a more civilized age.” Obi-Wan’s words set the Jedi apart right away – they use technology, but it’s good technology. More natural. Less corrupting. The crystals make this blatant: Sith red do not occur in nature. The Lurmen remind me of Yoda’s speech on Dagobah, and Obi-Wan allowing Vader to strike him down, and Luke throwing away his lightsaber rather than kill his father. Non-violence is pure good. But at the same time, it can’t win without someone also using technology for good. As with all things in Star Wars, balance is key.